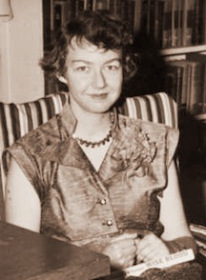 Today we celebrate the birth of one of the all-time greatest of the great writers — Flannery O’Connor, born in Savannah, Georgia, on March 25, 1925. Author of two novels — Wise Blood (1952), which she holds on her lap in the photo above, and The Violent Bear It Away (1960) — and 32 short stories, O’Connor created a lasting body of work in her short life (she died 50 years ago — in 1964 at age 39). In 2006, Haruki Murakami – author of The Wind-Up Bird Chronicle — accomplished a long-standing goal by translating The Great Gatsby into Japanese. Murakami has discussed his reverence for the F. Scott Fitzgerald novel many times over the years — and has written a compelling afterword to his translation. 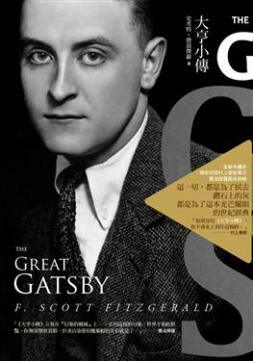 Read Murakami’s moving love letter to Fitzgerald’s masterwork at scribd.com. When someone asks, ‘Which three books have meant the most to you?’ I can answer without having to think: The Great Gatsby, Dostoevesky’s The Brothers Karamazov, and Raymond Chandler’s The Long Goodbye. All three have been indispensable to me (both as a reader and as a writer); yet if I were forced to select only one, I would unhesitatingly choose Gatsby. 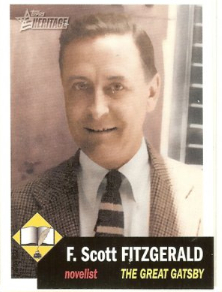 Had it not been for Fitzgerald’s novel, I would not be writing the kind of literature I am today (indeed, it is possible that I would not be writing at all, although that is neither here nor there). Whatever the case, you can sense the level of my infatuation with The Great Gatsby. It taught me so much and encouraged me so greatly in my own life. Through slender in size for a full-length work, it served as a standard and a fixed point, an axis around which I was able to organize the many coordinates that make up the world of the novel. I read Gatsby over and over, poking into every nook and cranny, until I had virtually memorized entire sections. 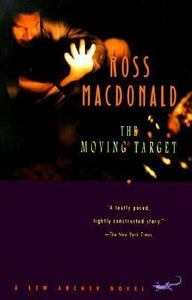 The Moving Target — originally published in 1949 — features Lew Archer, an L.A. private investigator, who appears in a series of novels by Ross Macdonald. While reading the work of this amazing wordsmith/poet, I was struck by its similarity to the best passages in The Great Gatsby by F. Scott Fitzgerald — and figured somebody somewhere must have written about this. A quick Google search revealed more than I’d hoped. My research uncovered a fascinating article entitled “Ross Macdonald’s Marked Copy of The Portable F. Scott Fitzgerald: A Study of Influence” by Robert F. Moss. In the article, Moss demonstrates how Macdonald learned from Fitzgerald on a variety of levels, including language, plot, structure, and technique. Macdonald is quoted as calling Fitzgerald “a dream writer,” “our finest novelist,” and “my master.” Read the entire article here. We rose into the offshore wind sweeping across the airport and climbed toward the southern break in the mountains. Santa Teresa was a colored air map on the mountains’ knees, the sailboats in the harbor white soap chips in a tub of bluing. The air was very clear. The peaks stood up so sharply that they looked like papier-maché I could poke my finger through. Then we rose past them into chillier air and saw the wilderness of mountains stretching to the fifty-mile horizon. The Moving Target was made into Harper, a 1966 movie starring Paul Newman. Legendary screenwriter William Goldman (Butch Cassidy and the Sundance Kid, All the President’s Men) adapted the novel for the screen — and considered The Moving Target his breakthrough script (it was his second screenwriting credit). Newman also starred as Lew Harper (the screen name for Lew Archer) in the 1975 movie The Drowning Pool, based on Ross Macdonald’s novel of the same name. 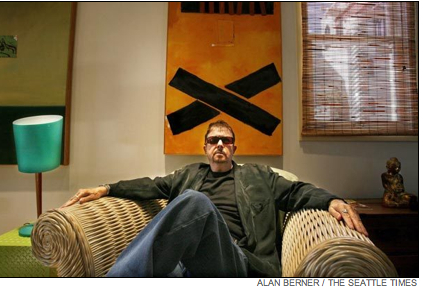 Today is Tom Robbins 77th birthday! Hard to believe that the wild and wacky author of Even Cowgirls Get the Blues has reached septuagenarian status. For me, reading Robbins’ 1971 novel Another Roadside Attraction was a revelation about what a novel could do and what it could be. Thank you, Tom, for opening up our minds and inspiring us with your imagination. 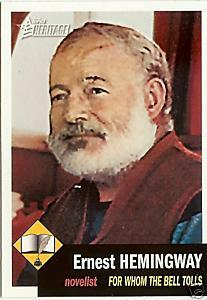 Though they were close friends and lived in Paris at the same time during the 1920s, Ernest Hemingway and F. Scott Fitzgerald never had their photo taken together, but here’s the next best thing — the novelists are two of the ten writers that grace “Heritage” trading cards issued in 2009 by Topps, a company famous for its baseball cards. The reverse side of each card includes stats about the author, a mini bio, and a literature quiz. Other writers in the series include Mark Twain, Harriet Beecher Stowe, Washington Irving, Edgar Allan Poe, Nathaniel Hawthorn, Emily Dickinson, Walt Whitman, and Henry David Thoreau. Paul Nebenzahl, whose poetry appears in the Silver Birch Press Summer Anthology (June 2013), recently sent a stash of these charming Topps cards (all the writers mentioned above, except for Thoreau). Thank you, Paul! We look forward to including more of the cards in future blog posts. “Escape from Spiderhead” appears in George Saunders‘ collection TENTH OF DECEMBER (Random House, 2013). Find the book at Amazon.com. 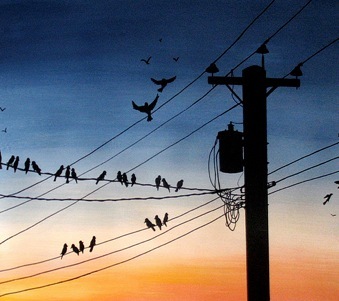 Illustration: “Birds at sunset,” watercolor by Linzy Arnott. Visit Linzy at linzyarnott.com. Quand étais plus jeune, ce qui veut dire plus vulnérable, mon père me donna un conseil que je ne cesse de retourner dans mon esprit. –Quand tu auras envie de critique quelqu’un, songe que tout le monde n’a pas joui des mêmes avantages que toi. 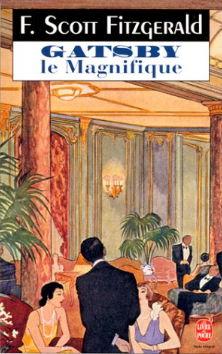 I checked out Amazon.fr (Amazon’s French site) and found numerous editions of Gatsby Le Magnifique — and many are among the site’s best-selling titles. 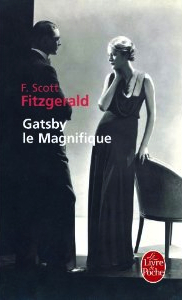 Say what you like about Baz Luhrmann‘s film adaptation starring Leonardo DiCaprio, but the movie has sparked a renewed interest in Fitzgerald’s novel among people around the world — and that is certainly magnifique. In 2006, renowned Japanese novelist Haruki Murakami — author of The Wind-Up Bird Chronicle — accomplished a long-standing goal by translating The Great Gatsby into Japanese. Murakami has discussed his reverence for the F. Scott Fitzgerald novel many times over the years — and has written a compelling afterword to his translation. Read Murakami’s moving love letter to Fitzgerald’s masterwork at scribd.com. 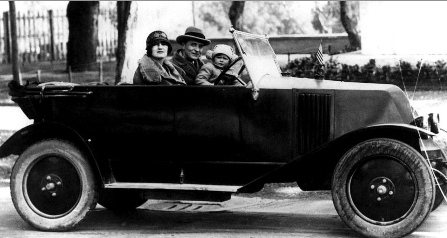 Photo: F. Scott Fitzgerald with wife Zelda and daughter Scottie, 1923, in the sports coupé the author purchased a few years earlier after selling his first novel, THIS SIDE OF PARADISE. Read more of this fascinating article here. What Type of Car Did Gatsby Drive? 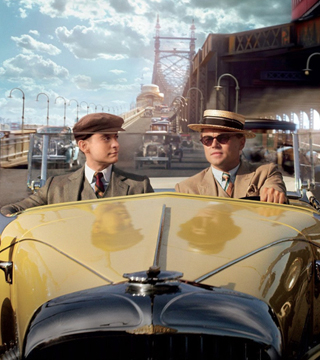 Photo: Nick Carraway (Tobey Maguire) rides with Jay Gatsby (Leonardo DiCaprio) in the 2013 film version of F. Scott Fitzgerald‘s The Great Gatsby. While Nick describes Gatsby’s car as “cream colored,” other characters in the book describe it as “yellow” — which, as most of us learned in high school, symbolizes Gatsby’s pursuit of the gold, of the American Dream. 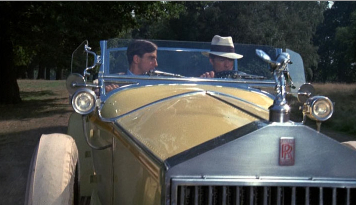 Photo: Nick Carraway (Sam Waterston) drives with Jay Gatsby (Robert Redford) in the 1974 film version of Fitzgerald‘s novel. But what make and model of car did Gatsby drive — in the novel and the various film versions? A recent article in the New York Times by Jerry Garrett offers some interesting answers. Since the information gets a bit convoluted, I’m going to resort to bullet points — and, in movie parlance, cut to the chase. 1974 movie (starring Robert Redford): Redford drives a 1928 Rolls-Royce Phantom — for a story set in 1922. 2013 movie (starring Leonardo DiCaprio): DiCaprio drives a 1929 Duesenberg Model J — again, for a story set in 1922. 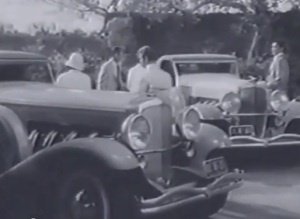 Photo: Cars featured in the 1949 film version of The Great Gatsby starring Alan Ladd.